We follow a two-year program. Students can choose to start in their sophomore or junior year, and will be confirmed in the subsequent school year. We have a very FUN and ENRICHING retreat. It’s sacred and it’s fun. It’s worth every minute, and some say it’s priceless. All are required to attend. We meet the 2nd and 4th Sundays of the month at 6:00 p.m., starting on September 11 and ending on May 7, 2017 — with some breaks built in. 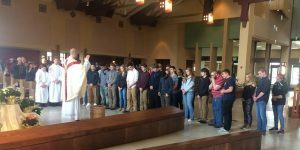 We involve all students in Mass ministries on the 1st Sunday of every month at the 11:30 a.m. Mass. We encourage a sacramental life: Mass, Eucharistic Adoration, Reconciliation, prayer – all intended to help us grow in friendship with Christ.